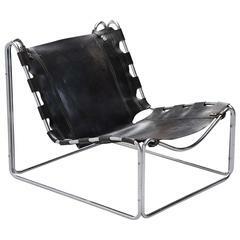 Beautiful, organic form, model '790' lounge chair designed by Joseph Andre Motte (1925-2013) for Steiner, France in 1960. This chair has been functionally restored salvaging the original rare old wool upholstery as used by Steiner We preserved one of the original wool upholstery covers from an earlier project of this model so we did and gave this chair a partial and functional restoration to preserve its authentic and original vintage look We used new Latex rubber foam filling and expensive, authentic Pirelli strapping. The chair retains its original 'Steiner' factory label under the oak frame A rare and beautiful model brought back to life We have left the oakwood frame in its original condition as proof of authenticity and to preserve the vintage character of the chairs, they exhibit some small areas of rubbing to the original varnish finish commensurate with originality, age and use. Please note that some pictures have some pixel distortion on the edges, this is caused by a software problem and show not in real life, we are working on, my apologies for this Literature: 'Les Decorateurs des annees 50,' page 249, Patrick Favardin, editions Norma, 2002. 'Steiner - L'aventure du Design,' page 10 Patrick Favardin, editions Norma, 2007. “Art Menager,” Editions Flammarion 1963, page 132. Original Steiner manufacturer's catalog. J. 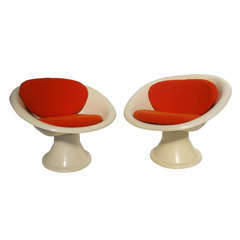 A. Motte was a member of the young and energetic post war II generation of French designers which included the likes of Pierre Guariche, René Jean Caillette, Michel Mortier, Alain Richard, Pierre Paulin, Antoine Philippon and Jacqueline Lecoq, among many others. Motte trained under René Gabriel and Louis Sognot at the 'l'école des arts appliqués à l'industrie' today known as the 'nationale supérieure des arts appliqués et des métiers d'art' (the National School of Applied Arts and crafts or ENSAAMA). This was followed by a further short stint training at Marcel Gascoin’s workshop. In 1954, Motte co-founded the Plastic Research Workshop known as 'ARP' with Pierre Guariche and Michel Mortier. He also worked with 'Group 4', a partnership with René-Jean Caillette, Geneviève Dangles and Alain Richard. 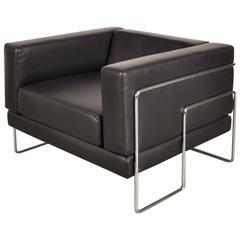 From 1950, he also collaborated with the furniture manufacturer Steiner. From the late 1950s onwards Motte's reputation as a leading and important figure in French design and architecture was further cemented when he was chosen by the French government to work on the interiors of several large and important public commissions such as Orly airport from 1958-1961, the naval station of Le Havre during 1963-1964 and in 1975 Paris' Charles de Gaulle airport (Roissy 1 and 2). In 1974 he was also commissioned by the RATP to redesign the stations of the Paris Metro including a seat that would become emblematic of the metro and which still equips many metro and RER stations in Paris. He also worked on the interior of the Musee du Louvre in Paris. 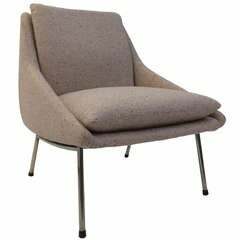 During this hugely productive period Motte won many prestigious design awards including the 'Prix René Gabriel' in 1957 and the 'prix Compasso d'Oro,' Gold Medal award at the Salone di Mobile, Milan in 1970. During the period 1966-68 Motte was also the chairman of the prestigious 'société des artistes décorateurs' in Paris. He also taught at the l'école nationale supérieure des arts décoratifs (the National School of Decorative Arts) for 30 years. In 2014, following increasing international recognition of Motte's work, the Galerie Pascal Cuisinier paid a further tribute to Motte's career through an exhibition at Design Miami / Basel and Paris titled. "Homage to Joseph-André Motte." Functionally restored back to vintage with new foam and authentic Pirelli strapping. The Oak frames left in their original condition to preserve the vintage character of the chairs, they exhibit some small areas of rubbing to the original varnish. 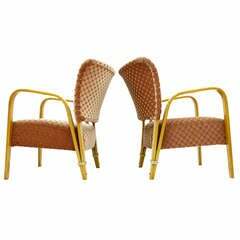 Nice Pair Bow Wood Lounge Chairs by Hugues Steiner, France, 1948. Ashwood, Fabric and Brass. Very comfortable. Very good original condition. Worldwide shipping.